For about a week, she tried hard to hold on and fight hard. But allegedly brutalised by her father for being born a girl, she stood little chance. 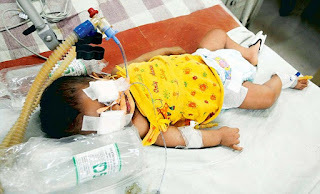 Baby Neha Afreen died after a cardiac arrest in a government hospital in Bangalore on Wednesday morning [Apr. 11]. The three-month-old baby was admitted to the Vani Vilas Hospital on Thursday night, April 5, with a severe head injury, dislocated neck and bite and burn marks on her body. Her father Umar Farooq, a car painter, is accused of inflicting the injuries on her because he wanted a male child. Though Afreen had showed signs of recovery on Tuesday, her condition deteriorated by evening because of repeated convulsions. 'She was in semi-comatose state since Tuesday evening. We had put her on life support system. Unfortunately, she could not make it', said Dr Some Gowda, medical superintendent of the hospital. The hospital authorities were awaiting a team of doctors from the National Institute of Mental Health and Neuro Sciences for assistance because the baby had suffered internal head injuries. But Afreen could no longer fight. She had hurried respiration of 30-40 per minute against the normal 20-25 and also pathycardia, or increased heart rate. She breathed her last at 11.10 am shortly after a cardiac arrest. Neha's Mother Reshma was afraid to contact police after she claimed her husband attacked their daughter. 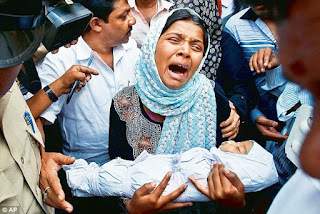 The baby's mother, 19-year-old Reshma Banu, was inconsolable when the doctors broke the news to her. 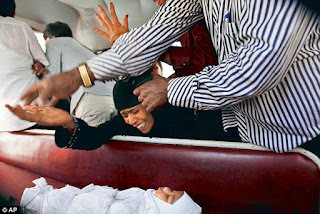 Afreen was her only child and she had been in a state of shock since Thursday. They should cut his balls off and shove them down his throat.